700 Things for Boys - an electric locomotive. Interesting little project - reminds me of the Carlisle & Finch mining locomotive. Those old "dangerous toys for boys" articles are great reading . ...and another. The header hints at the time period - certainly tinplatish! 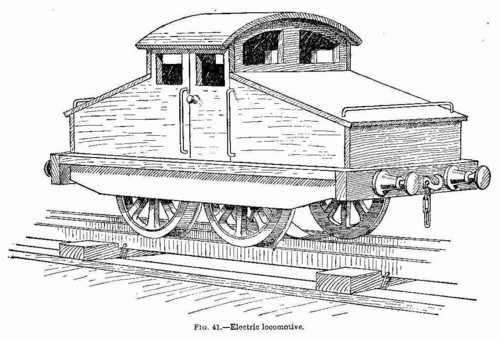 "The rapid increase in the number of electrically worked railways, and the substitution of the electric for the steam locomotive on many lines, give legitimate cause for wondering whether, twenty or so years hence, the descendants of the "Rocket" will not have disappeared from all the railways of the world, excepting perhaps those of transcontinental character." Are you going with the 120v ac route too? That would shock the crap out of a lot of folks here..
120 volts? Luxury! Don't forget your sulphuric acid, chromic acid and your mercury for making a power source - just like those old Carlisle & Finch or Lionel acid cells? "To amalgamate the zinc plates effectively, provide an ounce or two each of strong sulphuric acid and quicksilver.."
I can recall chasing Mercury around on a plate glass tray with a glass rod while Gramps was pouring the distilled water & acid into industrial battery cases he had rebuilt while I watched. I think they were used for a vintage Chriscraft though.